To gain an understanding of pediatric third-degree acquired atrioventricular (AV) block (AVB), one must first understand the concepts behind AV blocks. In general, AV block refers to a conduction delay or interruption of the impulses generated in the atrium before they reach the ventricles. AV block may be transient or permanent, and the anatomic level at which it occurs varies. These features determine the clinical significance of this condition, which may range from none to severely symptomatic, including Stokes-Adams syncope, congestive heart failure, or sudden death. In children, the most common cause of permanent acquired complete AV block is surgery for congenital heart disease. The second most common cause is congenital heart disease associated with complete AV block. Other etiologies of acquired AV block are often reversible and include digitalis and other drug intoxications, viral myocarditis, acute rheumatic fever, Lyme disease, and infectious mononucleosis. Rarely, complete AV block can occur as a complication of radiofrequency catheter ablation or during a diagnostic or interventional cardiac catheterization procedure (such as device closure of atrial or ventricular septal defects). Metabolic mitochondrial disorders and myotonic dystrophies can cause progressive AV block. In adults, aside from the etiologies mentioned for the pediatric group, other causes of complete AV block include myocardial infarction (especially inferior), coronary spasm (usually of the right coronary artery), and neoplasms (eg, cardiac mesotheliomas). Almost exclusive to adult patients are 2 degenerative diseases of the specialized conducting system: Lev disease and Lenègre disease. The following image depicts a normal intracardiac electrophysiologic study. This is an example of a normal finding on intracardiac electrophysiologic (EP) study. 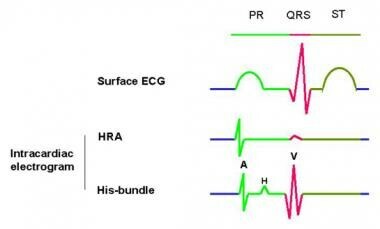 The surface electrocardiogram (ECG) is represented in different colors, with its corresponding intervals (ie, PR, QT) on top. A catheter with several electrodes is placed inside the heart, close to the superior vena cava–right atrial junction. This catheter records the sinoatrial node (SN) activity and is depicted here as the high-right atrial (HRA) deflection. Beneath the HRA intracardiac electrogram is the His-bundle intracardiac electrogram, which is recorded by the electrodes of a second catheter placed across the posterior aspect of the tricuspid valve. 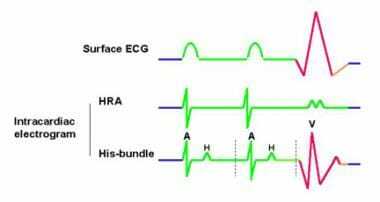 The His-bundle electrogram provides the most information about atrioventricular (AV) conduction. Three main deflections are present, with 2 intervals: (1) the A deflection corresponds to the activation of the low-right atrium, (2) the H deflection corresponds to the activation of the His-bundle before its branching into the Purkinje system, and (3) the V deflection corresponds to the activation of the proximal portion of the right ventricle. 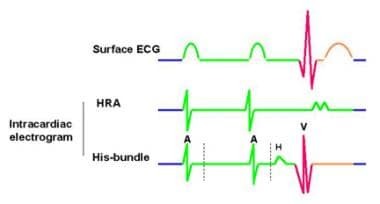 The atrium-His (A-H) interval represents the conduction time through the AV node. It shows the time elapsed between the activation of the low-right atrium (A) and the activation of the His-bundle (H), ranging normally from 50-120 milliseconds. The His-ventricle (H-V) interval is measured from the beginning of the H deflection to the beginning of the V deflection and represents the conduction time through the His-Purkinje system (normally 35-55 ms). Disease in the AV node prolongs the A-H interval, whereas disease in the distal conducting system prolongs the H-V interval. See also Atrioventricular Block, Pediatric Second-Degree Atrioventricular Block, Pediatric Third-Degree Congenital Atrioventricular Block, First-Degree Atrioventricular Block, Second-Degree Atrioventricular Block, and Third-Degree Atrioventricular Block. Depending on the anatomic level at which the atrial impulse is interrupted before reaching the ventricles, the atrioventricular (AV) block (AVB) may be classified as first degree, second degree, or third degree. The term first-degree AV block is actually a misnomer, because nothing is blocked; instead, the conduction time of impulses from the atrium to the ventricles is prolonged (PR prolongation on ECG). Second-degree AV block occurs either when successive impulses from the atrium to the ventricles are progressively delayed until conduction failure occurs (ie, Mobitz type I second-degree AV block, Wenckebach periodicity) or when an atrial impulse fails to conduct to the ventricles without any measurable lengthening of the preceding PR intervals (ie, Mobitz type II second-degree AV block) (see the first image below). Prolongation of the His-ventricle (H-V) interval may predispose individuals to complete or third-degree AV block (See the second image below). This is a Mobitz type II second-degree atrioventricular (AV) block. The surface electrocardiograph (ECG) shows normal PR intervals and a P wave that is not followed by a QRS (in this graphic, the first P wave does not conduct through the AV node). The intracardiac electrogram shows no His deflection (H) after the blocked A deflection. In this case, the escape rhythm originates higher in the AV node at a rate of 40-50 beats per minute and is fairly reliable. However, patients may report symptoms of bradycardia such as dizziness, fatigue, and syncope. Because this type of AV block may progress to complete or third-degree AV block, patients should be monitored regularly even in the absence of symptoms. This is a Mobitz type II second-degree atrioventricular (AV) block that may likely progress to a third-degree, or complete, AV block. The difference from the previous image is that, in this case, a His (H) deflection is present after the A deflection (the atrium-His [A-H] interval is maintained); however, no ventricle (V) deflection is present after the first H deflection. Therefore, in this case, the escape rhythm is slower than in the intracardiac electrophysiologic study of the patient in the previous image (&lt; 40/min) and less reliable. This patient is more likely to receive a pacemaker because of the higher incidence of sudden death secondary to prolonged asystole. In complete or third-degree AV block, the conduction of sinus or atrial impulses is entirely interrupted at the level of the AV node, in the bundle of His, or it is associated with an aberrantly located anatomic AV node that precludes normal anatomic communication to the distal conduction tissue. The atria and ventricles depolarize independently of each other, and the ventricular rate is typically slower than the atrial rate. The surface electrocardiograph (ECG) may reveal either narrow or wide QRS configurations, depending on the location of the interruption and the foci of the escape pacemaker tissue. For example, the QRS is narrow if the escape rhythm is supra-His bundle, or it is wide if the escape rhythm is intra-His or infra-His bundle. Escape ventricular rhythms with narrow QRS may be more stable than those with wide QRS morphologies. See the following images. This is a 12-lead electrocardiograph (ECG) of a 2-year-old girl with first-degree atrioventricular (AV) block that progressed to a complete, or third-degree, AV block (which is shown here). Her mother brought her to the clinic with described symptoms of easy tiredness and refusal to walk more than 1 block, which was a dramatic change for this girl. A normal sinus rhythm is present (shown by upward P waves in leads I, II, and aVF) at a rate of 135 per minute, which is completely dissociated from the QRS at a rate of 67 per minute. The QRS is narrow at 100 milliseconds with a frontal axis of 62°. No ventricular hypertrophy is present by voltage criteria. Because of the narrow QRS and its escape rate, this ECG is interpreted as complete AV block with junctional escape rhythm. This is a 12-lead electrocardiograph (ECG) of a 2-year-old girl with first-degree atrioventricular (AV) block that progressed to a complete, or third-degree, AV block (see the previous image). This ECG was taken after dual chamber (DDD-R) pacemaker placement. Sinus P waves are present at a rate of 90 per minute, followed by a pacemaker spike that produces a wide QRS of 128 milliseconds. No spike occurs before each P wave, because this type of pacemaker senses the patient's own P waves and stimulates the ventricle afterward. Therefore, the patient's ventricular rate follows her physiologic needs by tracking the patient's own atrial rate. With a DDD-R pacemaker, if the patient develops sinus bradycardia, the pacemaker takes over and paces the right atrium at the programmed rate, which is followed by the ventricular stimulation, maintaining AV synchrony. The atrioventricular (AV) node is composed of specialized cells arranged in 3 zones: (1) the atrial-transitional junction, (2) the transitional-compact node junction, and (3) the nodal-His junction or penetrating His bundle. These regions display different electrical properties, such as slowing of AV conduction with progressively increasing atrial rates until conduction block occurs, which protects the ventricles from dangerously rapid rhythms during atrial tachycardias. Other properties of the AV nodal cells include their ability to pace the heart by producing "escape rhythms" in case of a block above their anatomic level. These specialized cells, however, may begin to beat faster than the sinus node and may produce tachycardia. Complete AV block (AVB) may occur immediately when the AV node is injured by direct trauma during surgery or catheterization, by ischemia during a coronary event, and by myocardial inflammation and infiltration during a viral illness. This condition may also occur years after mediastinal radiation secondary to fibrosis. Certain congenital defects may also be inherently associated with vulnerability towards developing spontaneous AV block because of anatomic alteration in the arrangement of the AV node to the proximal His-Purkinje conduction tissue. These defects include L-transposition of the great arteries, some forms of double-outlet right ventricle or AV canal defects in the setting of heterotaxy syndrome, and other congenital heart lesions. Postsurgical complete atrioventricular (AV) block (AVB) is the most common cause for acquired AV block in children, resulting from trauma to the AV node at the time of surgery (ie, hemorrhage, ischemia, necrosis, inflammation, traumatic disruption). This condition may occur following repairs, including those for ventricular septal defect (VSD), L-transposition of the great arteries (especially), tetralogy of Fallot (TOF), aortic stenosis, and other forms of congenital heart disease. These patients not only have very slow heart rates, but they are also prone to asystole, with a high risk for sudden death if left unpaced. Complete AV block may occur with systemic infections that cause myocardial inflammation and infiltration, such as diphtheria, Borrelia burgdorferi infection (Lyme disease), Chagas disease, Rocky Mountain spotted fever, Yersinia enterocolitica infection, infectious mononucleosis, bacterial endocarditis, and viral myocarditis. Diphtheria is an infection of mucous membranes or skin caused by Corynebacterium diphtheriae, of which certain strains produce the diphtheria toxin. This protein can cause myocarditis, polyneuritis, and other systemic effects. Myocarditis occurs in 10-25% of patients with diphtheria and may develop during the acute phase or after several weeks. This consists of varying degrees of heart block, including complete AV block and arrhythmias, such as atrial fibrillation, premature ventricular beats, ventricular tachycardia, and ventricular fibrillation. Lyme disease is caused by the tick-transmitted spirochete B burgdorferi. It begins with an expanding skin lesion known as erythema migrans. Within several days or weeks, the spirochete spreads hematogenously, and approximately 8% of patients develop cardiac involvement. The most common abnormality is fluctuating degrees of AV block (ie, first-degree, second-degree, and third-degree AV block). Other more diffuse forms of cardiac involvement include left ventricular dysfunction, cardiomegaly, or pancarditis. Cardiac involvement usually lasts for a few weeks, although it may recur. Chagas disease is an endemic zoonosis in certain regions of Central and South America. It is caused by the protozoan Trypanosoma cruzi and is transmitted by hematophagous triatomae insects (ie, reduviids). These insects become infected after sucking blood that contains parasites from vertebrate hosts (eg, birds, mammals). Parasites reproduce in the guts of reduviids, and infective forms are discharged with feces at the time of subsequent blood meals. Therefore, the second host becomes infected with parasites because of skin abrasions that have been contaminated with infected feces. Symptomatic chronic Chagas disease becomes apparent years or even decades after infection. Right bundle branch block is the most common electrocardiographic (ECG) abnormality, but other types of AV block, including complete AV block, are frequently observed. 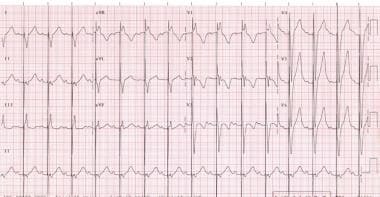 Other forms of rhythm disturbances include premature ventricular contractions, tachyarrhythmias, and bradyarrhythmias. Cardiomyopathy results in right-sided or biventricular heart failure. Rheumatic fever is an inflammatory disease that occurs from pharyngeal infection with group A streptococci, with multisystemic involvement. In acute rheumatic carditis, all the layers of the heart may be compromised. Although most patients with carditis are asymptomatic, some have valvular damage of the mitral and/or aortic valves that may produce regurgitation and even congestive heart failure. In terms of rhythm disturbance in patients with carditis, tachycardia disproportionate to the degree of fever and varying degrees of heart block may occur. The most common type of AV block is first degree. Reiter syndrome is a seronegative arthropathy that may be accompanied by pancarditis with involvement of the AVN (ie, varying degrees of AVB) and proximal aortitis with valve regurgitation. Both of these features are more common in patients with long-standing disease and peripheral joint involvement. Sarcoidosis is an inflammatory systemic disease characterized by formation of granulomas that most frequently affect the lungs, lymph nodes, skin, eyes, and liver. However, it may affect any organ. When it affects the heart, it may cause different types of conduction disturbance, from bundle branch block to complete AV block. [6, 7] Interestingly, the AV block may be reversible. [6, 8] Sudden death has been described. Ischemia from acquired coronary disease (eg, Kawasaki disease) or from inferior wall infarcts can transiently or permanently damage the conduction tissue, leading to variable degrees of AV block. Hypertension and aortic and/or mitral stenosis are believed to accelerate the degeneration of the conducting system through calcification and fibrosis. Myotonic dystrophy forms 1 and 2 are neuromuscular diseases inherited in an autosomal dominant fashion, with genetic anticipation, in which cardiac involvement consists of disorders of impulse formation and, especially, AV conduction. They are typically progressive and are caused by an expanded CTG repeat in the 3-prime untranslated region of the DMPK gene and by an expanded CCTG repeat in intron 1 of the ZNF9 gene, respectively. These diseases begin as asymptomatic PR prolongation and lead to complete AV block. Syncope and sudden death may occur; therefore, symptomatic patients require insertion of a permanent pacemaker. Diagnosis is mainly clinical. Kearns-Sayre syndrome (also known as oculocraniosomatic disease) is a neuromuscular disease caused by a mitochondrial DNA deletion. Its characteristic triad includes progressive external ophthalmoplegia, pigmentary degeneration of the retina, and progressive cardiac conduction defects, including complete heart block. Other features may include ataxia, hearing loss, dementia, short stature, delayed secondary sexual characteristics, hypoparathyroidism, hypothyroidism, and peripheral neuropathy. The diagnosis is usually made clinically and by demonstration of ragged red fibers on skeletal muscle biopsy. Any progression in conduction abnormalities (such as from first- to second- degree AV block) is a clear indication for permanent pacemaker implantation in Kearns-Sayre syndrome, given the unpredictability of disease progression. Tuberous sclerosis is a neurocutaneous disorder caused by mutations in any of 4 separate genetic loci in which cutaneous lesions of multiple types are associated with tumors and malformations of the central nervous system (CNS). Mental retardation may be severe, and patients develop intractable seizures. Cardiac rhabdomyomas within the AV node may cause complete AV block and different types of rhythm disturbances, such as ventricular tachycardia when localized in the ventricles. Diagnosis is clinical. The earliest lesions are leaf-shaped hypopigmented spots scattered over the trunk and limbs; they are observed better using a Wood lamp than with the naked eye. Almost exclusive to adult patients are 2 degenerative diseases of the specialized conducting system: Lev disease and Lenègre disease. In Lev disease, calcification and sclerosis of the cardiac skeleton frequently involve the mitral and aortic valves, the central fibrous body, and the summit of the ventricular septum. Lenègre disease is thought to represent a primary sclerodegenerative disease of the conducting system with no involvement of the myocardium or fibrous skeleton of the heart. Primary cardiac lymphoma has been described to cause complete AV block. [18, 19] Case reports of sinus rhythm restoration after tumor remission have been described. Drugs such as digoxin, beta-blockers, and calcium channel blockers may cause transient complete AV block, which can be fatal if the ventricular escape rhythm is inadequate to maintain brain blood flow or if asystole is prolonged. Anderson RH, Janse MJ, van Capelle FJ, et al. A combined morphological and electrophysiological study of the atrioventricular node of the rabbit heart. Circ Res. 1974 Dec. 35(6):909-22. [Medline]. Dobrzynski H, Nikolski VP, Sambelashvili AT, et al. Site of origin and molecular substrate of atrioventricular junctional rhythm in the rabbit heart. Circ Res. 2003 Nov 28. 93(11):1102-10. [Medline]. Bonatti V, Agnetti A, Squarcia U. Early and late postoperative complete heart block in pediatric patients submitted to open-heart surgery for congenital heart disease. Pediatr Med Chir. 1998 May-Jun. 20(3):181-6. [Medline]. Paech C, Dahnert I, Kostelka M, Mende M, Gebauer R. Association of temporary complete AV block and junctional ectopic tachycardia after surgery for congenital heart disease. Ann Pediatr Cardiol. 2015 Jan-Apr. 8 (1):14-9. [Medline]. Carminati M, Butera G, Chessa M, Drago M, Negura D, Piazza L. Transcatheter closure of congenital ventricular septal defect with Amplatzer septal occluders. Am J Cardiol. 2005 Dec 19. 96(12A):52L-58L. [Medline]. Berhouet M, Casset-Senon D, Machet MC, et al. Conduction defects as the presenting feature of sarcoidosis or observed during the course of the disease: regression with corticoid steroid therapy. Arch Mal Coeur Vaiss. 2003 Jun. 96(6):677-82. [Medline]. Konno T, Shimizu M, Ino H, et al. A rare type of alternating bundle branch block in a patient with cardiac sarcoidosis--a case report. Angiology. 2005 Jan-Feb. 56(1):115-7. [Medline]. Umetani K, Ishihara T, Yamamoto K, et al. Successfully treated complete atrioventricular block with corticosteroid in a patient with cardiac sarcoidosis: usefulness of gallium-67 and thallium-201 scintigraphy. Intern Med. 2000 Mar. 39(3):245-8. [Medline]. Ford SE. Congenital cystic tumors of the atrio-ventricular node: successful demonstration by an abbreviated dissection of the conduction system. Cardiovasc Pathol. 1999 Jul-Aug. 8(4):233-7. [Medline]. Evans DW, Stovin PG. Fatal heart block due to mesothelioma of the atrioventricular node. Br Heart J. 1986 Dec. 56(6):572-4. [Medline]. Kawano H, Okada R, Kawano Y, et al. Mesothelioma in the atrioventricular node. Case report. Jpn Heart J. 1994 Mar. 35(2):255-61. [Medline]. Lie JT, Lufschanowski R, Erickson EE. Heterotopic epithelial replacement (so-called "mesothelioma") of the atrioventricular node, congenital heart block, and sudden death. Am J Forensic Med Pathol. 1980 Jun. 1(2):131-7. [Medline]. Strauss WE, Asinger RW, Hodges M. Mesothelioma of the AV node: potential utility of pacing. Pacing Clin Electrophysiol. 1988 Sep. 11(9):1296-8. [Medline]. Subramanian R, Flygenring B. Mesothelioma of the atrioventricular node and congenital complete heart block. Clin Cardiol. 1989 Aug. 12(8):469-72. [Medline]. Thorgeirsson G, Liebman J. Mesothelioma of the AV node. Pediatr Cardiol. 1983 Jul-Sep. 4(3):219-23. [Medline]. Ozyuncu N, Sahin M, Altin T, Karaoguz R, Guldal M, Akyurek O. Cardiac metastasis of malignant melanoma: a rare cause of complete atrioventricular block. Europace. 2006 Jul. 8(7):545-8. [Medline]. Legoux B, Jegou B, Litoux P, Dreno B. [Cardiac metastasis of melanoma disclosed by tamponade]. Ann Dermatol Venereol. 1996. 123(6-7):393-4. [Medline]. Fujisaki J, Tanaka T, Kato J, et al. Primary cardiac lymphoma presenting clinically as restrictive cardiomyopathy. Circ J. 2005 Feb. 69(2):249-52. [Medline]. Musso P, Ronzani G, Ravera A, et al. Primary cardiac lymphoma presenting with complete atrioventricular block. Case report and review of the literature. Ital Heart J Suppl. 2002 Oct. 3(10):1047-50. [Medline]. Lim HE, Pak HN, Kim YH. Acute myocarditis associated with cardiac amyloidosis manifesting as transient complete atrioventricular block and slow ventricular tachycardia. Int J Cardiol. 2006 May 24. 109(3):395-7. [Medline]. Ogano M, Takano H, Fukuma N, et al. Sudden death in a case of cardiac amyloidosis immediately after pacemaker implantation for complete atrioventricular block. J Nippon Med Sch. 2005 Oct. 72(5):285-9. [Medline]. Okamoto H, Mizuno K, Ohtoshi E. Cutaneous sarcoidosis with cardiac involvement. Eur J Dermatol. 1999 Sep. 9(6):466-9. [Medline]. Adams MJ, Lipsitz SR, Colan SD, et al. Cardiovascular status in long-term survivors of Hodgkin's disease treated with chest radiotherapy. J Clin Oncol. 2004 Aug 1. 22(15):3139-48. [Medline]. Apter S, Shemesh J, Raanani P, et al. Cardiovascular calcifications after radiation therapy for Hodgkin lymphoma: computed tomography detection and clinical correlation. Coron Artery Dis. 2006 Mar. 17(2):145-51. [Medline]. Cohen SI, Bharati S, Glass J, Lev M. Radiotherapy as a cause of complete atrioventricular block in Hodgkin's disease. An electrophysiological-pathological correlation. Arch Intern Med. 1981 Apr. 141(5):676-9. [Medline]. Kaplan BM, Miller AJ, Bharati S, Lev M, Martin Grais I. Complete AV block following mediastinal radiation therapy: electrocardiographic and pathologic correlation and review of the world literature. J Interv Card Electrophysiol. 1997 Nov. 1(3):175-88. [Medline]. Leszczynska K, Chojnicki M, Haponiuk I, et al. [Analysis of pregnancy, labor and neonatal course in babies with prenatally-diagnosed complete atrioventricular heart block] [Polish]. Ginekol Pol. 2015 May. 86 (5):366-71. [Medline]. Villain E. Pediatric cardiac pacing: indications, implant techniques, pacing mode. Ann Cardiol Angeiol (Paris). 2005 Jan. 54(1):2-6. [Medline]. Saleh F, Greene EA, Mathison D. Evaluation and management of atrioventricular block in children. Curr Opin Pediatr. 2014 Jun. 26 (3):279-85. [Medline]. Epstein AE, DiMarco JP, Ellenbogen KA, et al, for the American College of Cardiology Foundation, American Heart Association Task Force on Practice Guidelines, et al. 2012 ACCF/AHA/HRS focused update incorporated into the ACCF/AHA/HRS 2008 guidelines for device-based therapy of cardiac rhythm abnormalities: a report of the American College of Cardiology Foundation/American Heart Association Task Force on Practice Guidelines and the Heart Rhythm Society. Circulation. 2013 Jan 22. 127 (3):e283-352. [Medline]. Epstein AE, DiMarco JP, Ellenbogen KA, et al, for the American College of Cardiology Foundation, American Heart Association Task Force on Practice Guidelines, et al. 2012 ACCF/AHA/HRS focused update incorporated into the ACCF/AHA/HRS 2008 guidelines for device-based therapy of cardiac rhythm abnormalities: a report of the American College of Cardiology Foundation/American Heart Association Task Force on Practice Guidelines and the Heart Rhythm Society. J Am Coll Cardiol. 2013 Jan 22. 61 (3):e6-75. [Medline]. Tracy CM, Epstein AE, Darbar D, et al. 2012 ACCF/AHA/HRS focused update of the 2008 guidelines for device-based therapy of cardiac rhythm abnormalities: a report of the American College of Cardiology Foundation/American Heart Association Task Force on Practice Guidelines. J Am Coll Cardiol. 2012 Oct 2. 60 (14):1297-313. [Medline]. Tracy CM, Epstein AE, Darbar D, et al. 2012 ACCF/AHA/HRS Focused Update of the 2008 Guidelines for Device-Based Therapy of Cardiac Rhythm Abnormalities: a report of the American College of Cardiology Foundation/American Heart Association Task Force on Practice Guidelines. Heart Rhythm. 2012 Oct. 9 (10):1737-53. [Medline]. Villain E, Ouarda F, Beyler C, et al. Predictive factors for late complete atrio-ventricular block after surgical treatment for congenital cardiopathy. Arch Mal Coeur Vaiss. 2003 May. 96(5):495-8. [Medline]. Bullock A, Finley J, Sharratt G, Ross D. Single lead VDD pacing in children with complete heart block. Can J Cardiol. 1998 Jan. 14(1):58-62. [Medline]. Bostan OM, Celiker A, Karagoz T, Ozer S, Ozme S. Dual chamber cardiac pacing in children: Single chamber pacing dual chamber sensing cardiac pacemaker or dual chamber pacing and sensing cardiac pacemaker?. Pediatr Int. 2002 Dec. 44(6):635-40. [Medline]. Vatasescu R, Shalganov T, Paprika D, et al. Evolution of left ventricular function in paediatric patients with permanent right ventricular pacing for isolated congenital heart block: a medium term follow-up. Europace. 2007 Apr. 9(4):228-32. [Medline]. Thambo JB, Bordachar P, Garrigue S, et al. Detrimental ventricular remodeling in patients with congenital complete heart block and chronic right ventricular apical pacing. Circulation. 2004 Dec 21. 110(25):3766-72. [Medline]. Lewicka-Nowak E, Dabrowska-Kugacka A, Tybura S, et al. Right ventricular apex versus right ventricular outflow tract pacing: prospective, randomised, long-term clinical and echocardiographic evaluation. Kardiol Pol. 2006 Oct. 64(10):1082-91; discussion 1092-3. [Medline]. Occhetta E, Bortnik M, Magnani A, et al. Prevention of ventricular desynchronization by permanent para-Hisian pacing after atrioventricular node ablation in chronic atrial fibrillation: a crossover, blinded, randomized study versus apical right ventricular pacing. J Am Coll Cardiol. 2006 May 16. 47(10):1938-45. [Medline]. Vinter S, Isaksen C, Vesterby A. Sudden cardiac death in a young woman: tumor of the atrioventricular (AV) node or citalopram intoxication?. Am J Forensic Med Pathol. 2005 Dec. 26(4):349-51. [Medline].